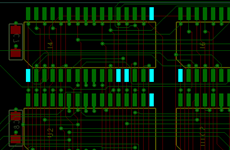 With FloWare mudule Highlight Dummy Pins you can assign in a OrCAD PCB Editor or Allegro PCB Editor design a color to each unconnected pin. In a report you can see all unconnected pins and wlk them through one by one. Crossprobing from the report will zoom in the pin in the design. This app is usefull for reviews of a design and you need to verify each unconnected pin, if it was unconnected intentionally or unintentional.